Sometimes making it look older is the most effective way to give an old piece a new look. 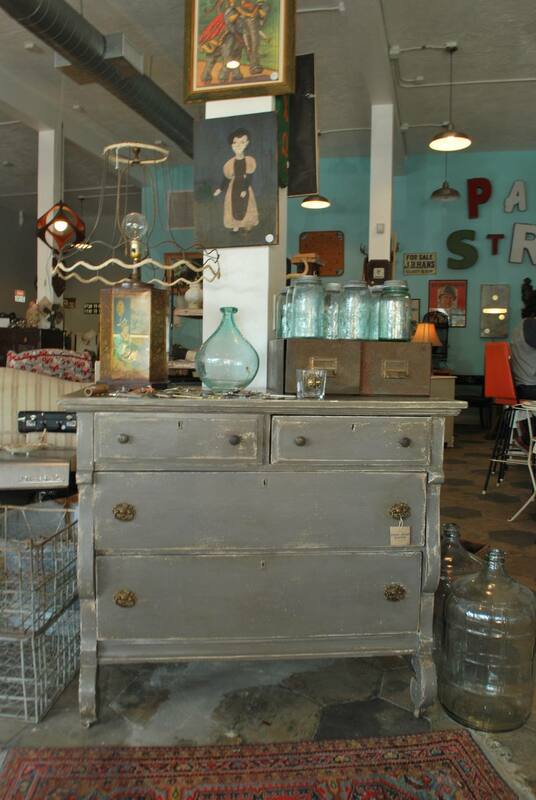 Vintage dressers and chests are no exception, especially on a painted finish. Choose from a variety of antiquing methods or opt for a mix of more than one. Sanding is one of the simplest way to antique a painted finish. Once your new paint finish dries, use a sanding block with medium-grit sandpaper to sand some of the new paint away. You can sand through to the bare wood, or sand lightly to reveal a previous paint color. Sand the areas where the paint would have worn away over time naturally, such as corners, edges, and the areas around the pulls on door and drawer fronts. Applying darker glaze to the crevices is another way to give a piece an antique look. Paint or rag the glaze into the recessed areas of carving, fluting, and even the dings. Then, wipe the excess glaze away from the higher points immediately. The glaze method works on painted and stained finishes. If you want the piece to look like it got dinged and dented over time, beat it with a length of chain after painting or staining, but before applying any glaze. If you like the crackled look, paint your vintage dresser or chest with two layers of paint, each in a different color. Apply a crackling medium once the final paint coat dries. As the crackling medium dries, the outer paint shrinks and crackles to reveal the hidden paint color. If the painted or varnished piece already has a crackled look (called alligatoring), you can change the finish without losing the original texture. Instead of sanding, brush or spray the piece with a bonding primer. After the primer dries, paint the piece with a new color of your choice. The alligatoring will still show. Add color and pattern to your old dresser or chest by decorating it with wallpaper. For the easiest application, you can apply wallpaper just to the drawer fronts. For a more exciting effect, wallpaper the entire piece. Make sure you match up the pattern across the different parts of the furniture for the most professional look. For a collage-like paper finish, decoupage your vintage dresser or chest. As with wallpaper, you can cover the entire piece, or just the drawer fronts and top. Play with different arrangements before you lacquer your paper goods into place. Your collage can include photos, postcards, wrapping paper, ticket stubs, love letters, scrapbook paper, old book pages, or any type of vintage ephemera. In French, faux bois means false wood. When it comes to your dresser or chest makeover, think of faux bois as refinishing your piece to look like it's made of more decorative or exotic wood. Depending on the wood you want to imitate, you'll use paint, stain, or a combination of the two. With some finishes, you may be able to embellish the existing color. With others, you'll need to start fresh with a new painted or stained finish. Faux bois options include painting the piece to look like zebra wood or mimicking the elaborate cathedral patterns of mahogany. For a more subtle effect, you can mask off areas of your piece with painters' tape, and then paint the exposed areas to look like delicate inlay.